"We set up a same day appointment so we could see the venue, and wow did it exceed our expectations. We fell in love with the chapel's large stained glass windows that allowed ample natural lighting. We also loved the dark oak pews, and stone exterior of the church. Mackenzie & Matt were married July 23rd, 2016 on a beautiful summer day at Events on 6th in Tacoma, WA. 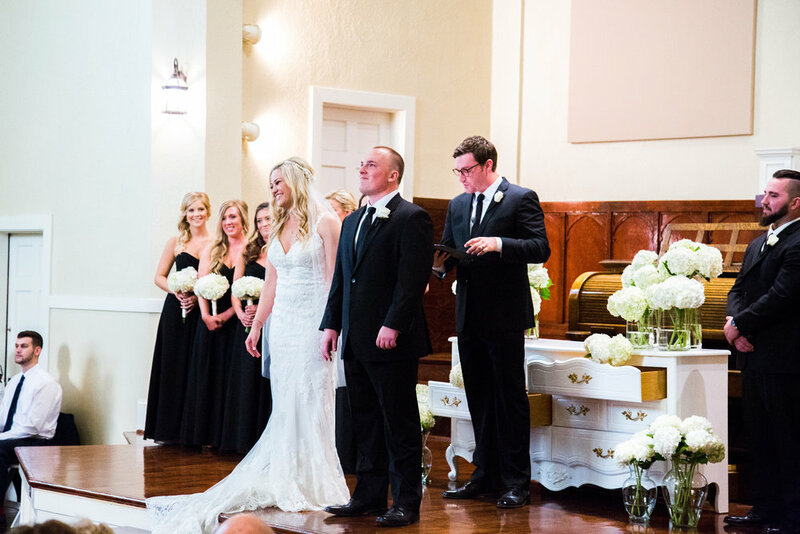 The couple wed before family and friends in a lovely, classic ceremony and celebrated together amidst simple beauty, and fun, personal touches. That Saturday was gorgeous, 75 degrees and partly sunny. “We truly lucked out and had the most perfect weather on our wedding day.‭ ‬It wasn’t too hot and there was not raindrop in sight,” said Mackenzie. After some photos at a park down the street, the wedding began at 4:30 pm, with the pastor of the couple’s home church officiating. Cousins of the bride played violin and guitar during the seating of guests,‭ ‬processional,‭ ‬communion,‭ ‬and recessional.‭ “‬The duet sounded beautiful and the music carried very well in the chapel,” said the bride. The bridesmaids walked down the aisle in floor length,‭ ‬strapless,‭ ‬black chiffon dresses and the groomsmen and groom matched the ladies in black suits with white shirts and black ties. “We chose suits because we thought tuxedos would be a bit too much as our guys are also not‭ ‘‬bow tie guys;’” explained the bride, “‭ t‬he suits fit the classic look and feel,‭ ‬and fit everyone’s personalities so well!”‭ ‬ Mackenzie’s dress was ivory with a lace overlay and beading around the sweetheart neckline. The straps were a spaghetti strap lace that lead into a completely cutout back.‭ The beautiful ‬train complimented the ambience of the traditional chapel. The bride also added a very special touch by‭ redesigning‬ and wearing the veil her mom wore when she married. The bride and groom shared the same moment as their favorite on their wedding day: seeing each other for the first time. Mackenzie said, “My first look with Matt was so special.‭ ‬He stood at the end of the aisle facing the stage and I walked down the aisle toward him,‭ ‬wrapped my arms around him,‭ ‬and whispered in his ear to turn around." 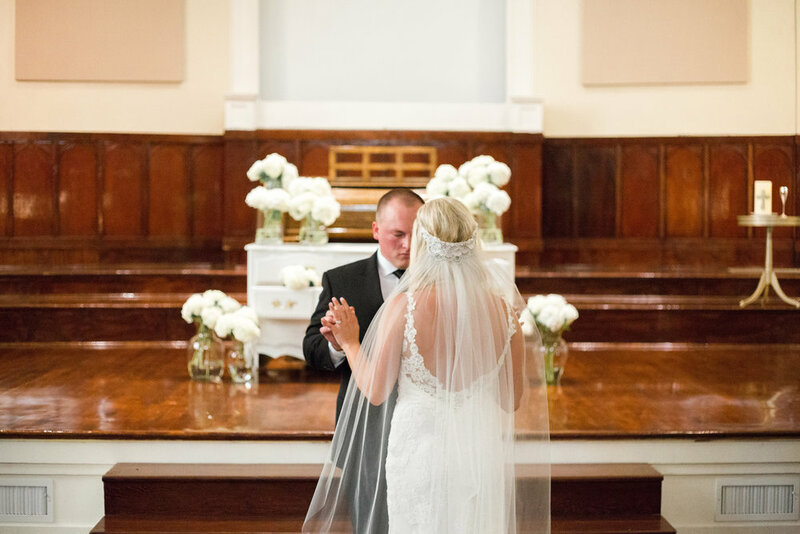 Matt added, “She’s always beautiful, but I was absolutely speechless when I saw her in her wedding dress.” Rachel Peterson of RP Imagery captured all the photos throughout the day, including this special moment of their ‘first look’. 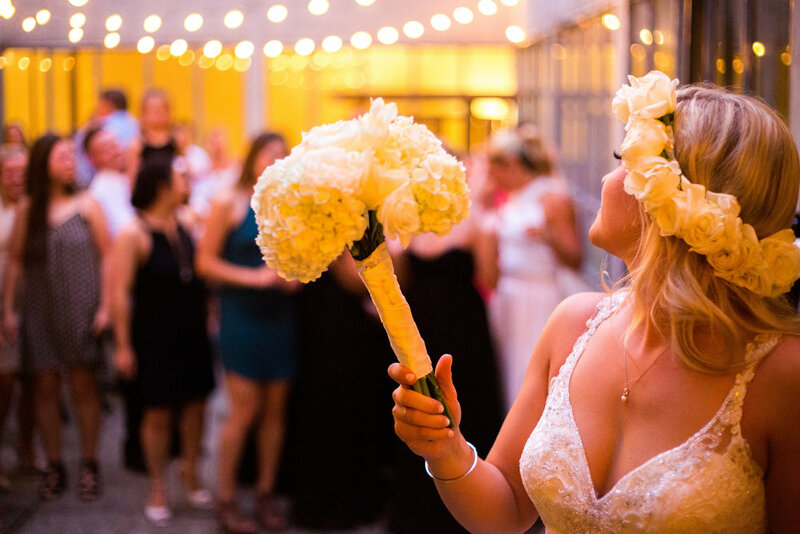 “She is incredible and worth every penny; she even did our video!” said the happy bride. The cake by Jenn’s Sweet Cakes was three delicious flavors: chocolate cake with vanilla frosting, banana cake with vanilla cream filling and white velvet cake with triple berry filling. “Jenn is a baker extraordinaire! 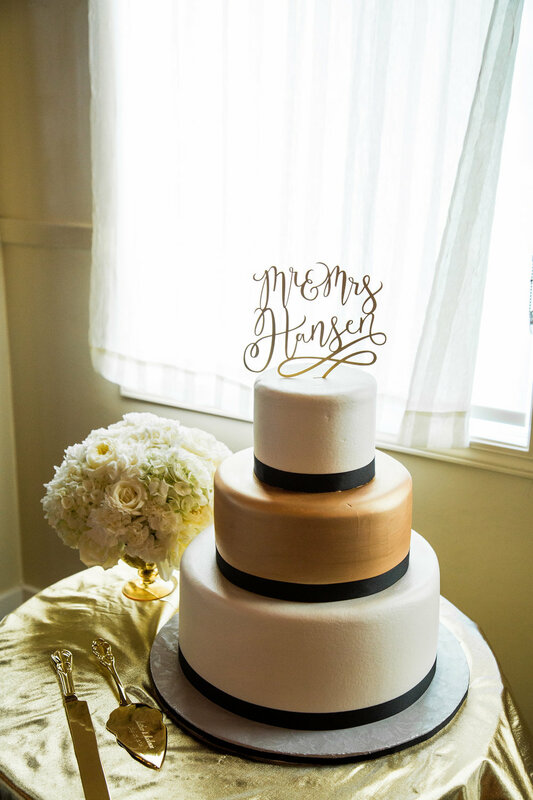 Our three-tiered wedding cake was absolutely stunning and tasted as good as it looked!” exclaimed Mackenzie. Laura the DJ from We Heart Weddings continued to impress throughout the night. Mackenzie said, “The DJ really sets the tone of weddings and Laura did an AMAZING job‭!” The couple danced to Come Away with Me by Nora Jones, the bride and her father danced to Bob Carlisle’s Butterfly Kisses, and Matt treated his mom to a dance to Perfect Fan by Backstreet Boys. The exuberant guests spilled out into the garden courtyard and lounge, dancing the night away and enjoying the party. As the night ended, the couple exited to a display of sparklers.‭ “T‬he‭ ‬4th of July is my favorite holiday and it was the perfect way to end the night," said Mackenzie. Matt and Mackenzie headed off into the night and off to their relaxing honeymoon in Montego Bay, Jamaica where they enjoyed fantastic food, gorgeous weather, and fun on the beach and in the pool.